Make your movie nights epic with this 65 inch Ultra HD certified LED TV from Hisense. Upscaling technology enriches every scene with breath-taking details - whether it’s from a 4K stream or your favourite Blu-rays. HDR technology recreates images in a realistic range of rich colours and contrast – so you can enjoy movies just the way the director intended. Connect to your favourite on demand services with Smart TV features, or catch live TV through Freeview HD, with 70 subscription-free channels including 15 in HD. The 4 HDMI ports let you plug in games consoles and Blu-ray players while 3 USB ports give you the option to connect external drives to see your home movies on the big screen. 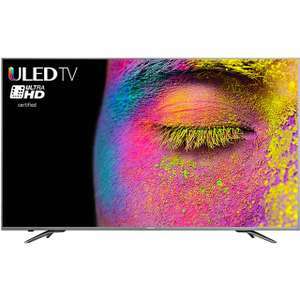 This is an excellent TV for the money and reduced from £999.99 to 899.00 but i've just phoned Richer Sounds who have it up for £950.00 (managed to get it for £924.00 inc delivery) with 6 year warranty! 2 year manufacturer warranty on this from AO. And there's 5% (£45) cashback on TCB which could make it £854. What number do I need to call to speak John Lewis for price match? Should be the Customer Services number or use the web-link on the site (they get back to you fairly quickly via email). The 6 year warranty from RS swung it for me. Yea, it does say "we don't match online-only or mail order businesses such as Amazon, ASOS or AO.com"
Yea, it does say "we don't match online-only or mail order businesses such …Yea, it does say "we don't match online-only or mail order businesses such as Amazon, ASOS or AO.com"
The Quidco cashback you mentioned would make it the cheapest deal for this model anywhere but for peace of mind it's worth paying a little extra and going for the longer warranty.